Smart Detect System automatically detects wire size and adjusts closing pressure as needed. LCD Control Panel offers an easy to read display and touch sensitive buttons for easy operation. Magnetic back aligns and holds the wire securely during the closing process. Optional FlexiPunch Mount allows the FlexiCloser to be mounted on top of the FlexiPunch Modular Punch Machine . The all new Akiles FlexiCloser Automatic wire closer is the easiest to use, reliable, and convenient wire closer to date. 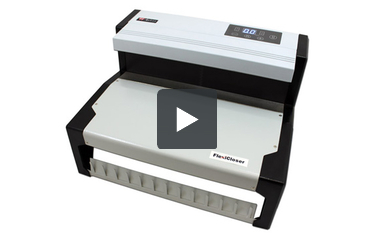 The Akiles FlexiCloser features an automatic wire closer that uses a smart detect system to quickly, easily, and precisely detect the wire size and adjust closing pressure to bind your document. The FlexiCloser from Akiles also features an easy-to-use LCD control panel, built-in wire holder, and much more to make your document binding production lightning fast and as simple as ever. Whether you are a large-scale book binder or a smaller sized office, this automatic FlexiCloser wire closer from Akiles fits perfectly and will surely speed up your productivity. Check it out today and save with MyBinding.com. Built-in wire holder to store wire spines in an easy-to-reach location. Safety Sensor provides safe and trouble-free closing without the risk of injury. Wire Closing Range: 3/16" to 1 1/2"
There's one power on switch on the back and you're ready to go. A great trick in wire binding is this one that hides the seam of the wire bind. Simply flip the back cover around so the back of the back faces the front of the front. Next, place the wire over the wire rack on the front of the machine. Once you have it all flat and even, drape your project over the teeth of the wire. When all the holes are threaded, lift your project up and twist the wire bind so that the ?C" faces the back of the back of the machine. Slide the unclosed bind into the back until it reaches the magnet and sticks. At the press of the bind button, the machine comes down and closes your wire bind. And check out your finished project. If for some reason the bind is too tight or too loose, with the LCD panel, you can make adjustments, either less or more tension. Note that the top jaw of the machine does not return to the upper position. That's because the FlexiCloser senses and memorizes the size of your project, setting itself up to repeat the same action over and over more quickly, for further projects, all with the push of a single button. The binds are consistent, and your seams are hidden by that back page. The FlexiCloser can also close 2:1 wire bind as well as the 3:1. The process is exactly the same. However, you'll notice that the wire bind is too large for the memorized setting here. Simply hit the reset button, jaws go up, and you're all set for a new setting. Place the ?C" toward the back of the magnetic wall, line it up, and press the button. The closer comes down, and all is done. It really is that easy and that quick with the FlexiCloser automatic wire closer. For more demos and reviews of this product and many more, check out MyBinding.com. Transcript: Welcome to MyBinding video. This is a product review of the FlexiCloser by Akiles, an automatic wire closer. Built for the office or organization that has a lot of wire binding to do, the Akiles FlexiCloser is an awesome machine. Let's review what it does and its features as we watch it work. Welcome to MyBinding video. This is a product review of the FlexiCloser by Akiles, an automatic wire closer. Built for the office or organization that has a lot of wire binding to do, the Akiles FlexiCloser is an awesome machine. Let's review what it does and its features as we watch it work. In short, the FlexiCloser closes wire binds and memorizes the settings for repeated action. We really liked how simple the machine is. One panel with four buttons and a power button. The built-on wire rack in the front is one of the best in the business. It's plenty large with great spacing to work with different size wires. The little bit of extra room seems insignificant, but for threading books, it makes it much easier. Construction of the wire rack as well as the entire machine is very sturdy, very competent. When it comes to the main function of the machine, the FlexiCloser is impressive. There's a magnet on the back face of the machine that holds your wire bind close to the wall while it crunches. All of our binds were consistent from top to bottom on every spine. Though we never used it in our workings, half the buttons on the top of the machine are for adjusting up or down on the amount of tension on the closer. After making the first close on the wire project, the FlexiCloser memorizes the settings for repeated use on multiples of the same project, all with the push of a button. The FlexiCloser can close 2:1 and 3:1 wire binds. Note that this 2:1 wire is much larger than the 3:1 before it. The memorized settings are quickly reset by hitting the reset button. The FlexiCloser automatically erases the old settings and sets new ones with the next wire close. We were truly impressed by its consistent performance on different size wire binds. There's a metal plate that the bottom of the wire bind sits on during the operation. The grip of this type of strip is far greater than most wire closers. When it comes to safety, there's no concern because the sensor on the bottom of the upper jaw will not allow it to close down with force on anything other than a wire bind. In our review of this machine, we found really no limitations. It is $1250, which is quite an investment. But if you have a lot of wire binding to do and you need it to be done well, the FlexiCloser by Akiles is well worth it. For more reviews and demos of this product and many more, check out MyBinding.com. The FlexiCloser is compatible with 2:1 and 3:1 pitch wire spines that are up to 1.5” across. The machine can also work with Spiral-O spines, so it’s very versatile. This device has the ability to detect the size of the spine. When this happens, the wire closing plate will come down and exert the right amount of pressure to close the spine. The machine will store that setting in its memory so you can bind multiple documents quickly and easily. You’ll be able to stay safe when using the FlexiCloser because it has a Safety Sensor feature. If the machine detects a non-wire item in the binding area – such as your hand – the wire closing plate won’t come down all the way. Thus, you can safely move your hands and keep binding. 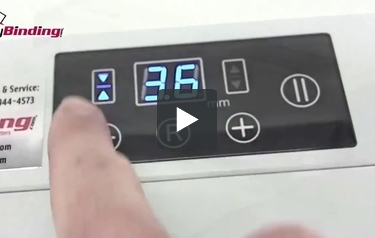 The FlexiCloser has an LCD display and easy-to-use buttons to reset the machine and adjust the settings as necessary. Overall, the machine is very user-friendly. Finally, the FlexiCloser comes with a 1-year warranty. There simply isn’t another machine like the Akiles FlexiCloser on the market. It’s definitely the machine to get if you do wire binding on a regular basis. You can find this excellent device at MyBinding.com along with a full selection of wire spines. Visit our website today so you can start binding with the FlexiCloser. Do you have international shipping service outside USA ??? If so, please advise ordering / payment and delivery process. We interest brand akiles-flexicloser automatic wire closer but we are Bangkok, Thailand. Thank you for your question. We do ship internationally. If you put items in your cart and view the cart, you can enter your country and postal code to get the shipping cost. For international orders we only accept PayPal or wire transfer (there is a fee for wire transfers) as payment. Please contact our customer service department directly if you need assistance placing the order and we would be happy to help.